Pounders offers free Wifi, which is provided by OTELCO. One of the great things about working for OTELCO is that we have the best customers. At the end of the day, they are what makes up our company. Last week, OTELCO participated in the Oneonta Business Association’s first-ever Festival of Lights. Not only was it a wonderful way to kick off the Holiday Season, but it was also an opportunity for us to get to know some of our Alabama customers. These four Oneonta restaurants provided me with a true Alabama experience, by introducing me to both southern cuisine and their world-famous hospitality. Based off of their recommendations, I tried everything from Cajun to BBQ and whether it was deep fried, slathered, smoked or served over rice I loved it. My only regret was that I couldn’t have stayed to try everything on their menus. When I was walking through Oneonta’s downtown Tuesday afternoon, very hungry and slightly lost, I stumbled upon this seafood restaurant. 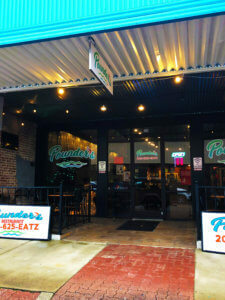 Once inside Pounders, it feels like you are at a seafood restaurant down on the gulf. The corrugated steel walls have a rustic feel that is artfully complemented by the vintage signs that adorn them. It was here that I had my first encounter with corn nuggets. Corn nuggets, it turns out, are basically little balls of deep-fried cream corn and they are delicious. Any other way to eat corn pales by comparison. I think what was even more delightful than the nuggets themselves was the patience shown by our waitress as I asked question after question about the menu. She graciously explained such things as the difference between corn nuggets and hushpuppies, and what exactly a hamburger steak dinner was, all while steadily supplying me with a never-ending flow of sweet tea. I ended up having the hamburger steak dinner, it was delicious, as were the Cajun vegetables that came with it. 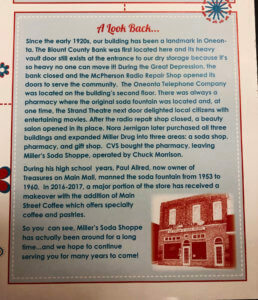 A brief history of Miller’s local history. Now I have never been one to turn down a dessert, so aft my delicious meal of BBQ and collard greens (I could have eaten a pound of their collard greens alone) I took his advice. What came next was a heavenly combination of vanilla pudding, fresh banana slices, and homemade cookies. From that day forward, Ken’s banana pudding would be my favorite dessert. Both times I had the chance to go to Miller’s it was packed, probably because of it’s delicious food and comfortable atmosphere. As soon as you step through the front door of Miller’s Soda Shoppe you feel transported into a simpler time when malts were sold at drug store counters and phones were far too big to fit in your back pocket. They serve everything from life-changing Malt Milk Shakes to the stunning Shoppe Dog (a hot dog topped with sauerkraut, chili, coleslaw, and cheese). Miller’s rich local history adds to their small town charm. They have been everything from a bank to a café in their time. In fact, during the great depression, it was even home to the Oneonta Telephone Company, which later became a part of OTELCO. It is only fitting that today they remain a loyal OTELCO customer. Swamp Tail’s Cajun Restaurant and Bar played host to OTELCO not once, but twice during our trip to Oneonta. When we were planning our trip down south, we asked around the Oneonta and Arab offices to get an idea of where we should hold a little company get-together. Everyone recommended Swamp Tails. On Friday night, they provided a shmorgishborg of authentic Cajun cuisine that had this New Englander ready to move to the bayou. I tried everything from alligator bites (tastes like chicken) to gumbo that night and was not disappointed. Of all the things I tried, the boudin balls were easily my favorite, even though I am still not quite sure of their pronunciation. That following morning we were back at Swamp Tail’s to kickoff the Festival of Light’s Selfie Shopping Extravaganza. 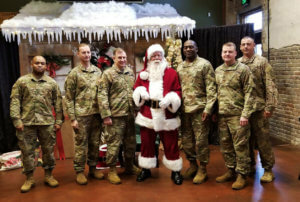 We helped out by greeting families coming in for photos with Santa, by serving hot cocoa and cookies while they waited. While we were there, we took advantage of Swamp Tails fabulous Christmas brunch, including such delicacies as beignets and pepper jack grits. Santa even had some very special brave grown-up visitors! I am so happy that OTELCO is able to provide services to business such as these. Businesses that treat their customers like old friends, even if they are a bunch of Yankees who don’t even know what etouffee is. So if you ever find yourself in Oneonta, do yourself a favor and stop into one of these establishments. I promise you won’t be disappointed.